In baseball, the umpire is the person charged with officiating the game, including beginning and ending the game, enforcing the rules of the game and the grounds, making judgment calls on plays, and handling the disciplinary actions. The term is often shortened to the colloquial form ump. They are also sometimes addressed as blue at lower levels due to the common color of the uniform worn by umpires. In professional baseball, the term blue is seldom used by players or managers, who instead call the umpire by name. Although games were often officiated by a sole umpire in the formative years of the sport, since the turn of the 20th century, officiating has been commonly divided among several umpires, who form the umpiring crew. Bakersfield is a city in and the county seat of Kern County, California, United States. It covers about 142 sq mi (370 km2) near the southern end of the San Joaquin Valley and the Central Valley region. Bakersfield's population is around 380,000, making it the 9th-most populous city in California and the 52nd-most populous city in the nation. The Bakersfield–Delano Metropolitan Statistical Area, which includes all of Kern County, had a 2010 census population of 839,631, making it the 62nd-largest metropolitan area in the United States. The more built-up urban area that includes Bakersfield and areas immediately around the city, such as East Bakersfield, Oildale, and Rosedale, has a population of over 520,000. Bakersfield is a charter city. Ferguson Arthur "Fergie" Jenkins CM is a Canadian former professional baseball player and coach. He was a Major League Baseball (MLB) pitcher for the Philadelphia Phillies, Chicago Cubs, Texas Rangers, and Boston Red Sox, from 1965 through 1983. James Louis Fregosi was an American professional baseball player and manager. He played in Major League Baseball as a shortstop. During an 18-year baseball career, he played from 1961 to 1978 for four different teams, primarily the Los Angeles and California Angels. In that franchise's first eleven years of play, he became its first star as the team's most productive and popular player. He led the American League (AL) in double plays twice, winning the 1967 Gold Glove Award, and upon leaving the team ranked ninth in AL history with 818 double plays. He holds the franchise record with 70 career triples; several of his other team records, including career games (1,429), hits (1,408), doubles (219), runs (691) and runs batted in (546), were broken by Brian Downing between 1986 and 1989. He returned to the team as manager, guiding it to its first-ever postseason appearance in 1979, and later managed the Philadelphia Phillies to the 1993 National League pennant. He was the top advance scout for the Atlanta Braves when he died. He suffered a stroke while on a cruise with Major League Baseball alumni in February 2014 and was taken to a hospital in Florida for treatment where he was put on life support. He was taken off life support after suffering multiple strokes in the hospital, and died a few hours later. Jon Erich Rauch is an American former professional baseball pitcher. At 6 feet 11 inches (2.11 m), he is the tallest player in Major League Baseball history. He is also an Olympic Gold Medalist. Robert Wesley Knepper is an American former Major League Baseball pitcher. From 1976 to 1990, he pitched 15 seasons for the San Francisco Giants and Houston Astros, earning two All-Star appearances as well as the 1981 NL Comeback Player of the Year award. He generated controversy with his 1988 remarks about female umpire Pam Postema and the National Organization for Women. Robert Paul Wine Sr. is a former shortstop, coach and manager in Major League Baseball. An excellent fielder who struggled as a batsman, Wine spent 12 seasons in the National League with the Philadelphia Phillies and the Montreal Expos (1969–72). He won the NL Gold Glove Award in 1963. 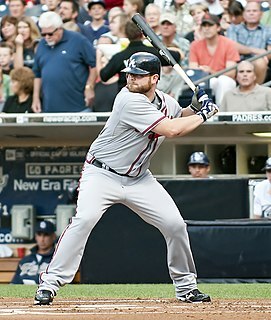 Brian Michael McCann is an American professional baseball catcher for the Atlanta Braves of Major League Baseball (MLB). He has played in MLB for the Braves from 2005 to 2013, New York Yankees from 2014 to 2016 and Houston Astros from 2017 to 2018. McCann is a seven-time All-Star and a six-time Silver Slugger Award winner. He won the 2017 World Series with the Astros over the Los Angeles Dodgers. 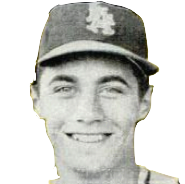 Gordon Craig Reynolds is a former Major League Baseball (MLB) shortstop who was an inaugural member of the Seattle Mariners. He batted left-handed and threw right. Wallace Robert Bell was an umpire in Major League Baseball (MLB) who worked in the National League from 1992 to 1999 and in both major leagues from 2000 to 2013. He wore the number 35. Joseph Daniel Votto is a Canadian professional baseball first baseman for the Cincinnati Reds of Major League Baseball (MLB). He made his MLB debut with the Reds in 2007. Philip Cuzzi is an American professional baseball umpire in Major League Baseball (MLB). He worked as a reserve umpire in the National League (NL) from 1991 to 1993 and returned to the NL in 1999. Since 2000, he has worked in both major leagues. Cuzzi wore number 99 when his career started; he now wears number 10. William Joseph Stewart was an American coach and sports official who was a referee in the National Hockey League (NHL) and an umpire in Major League Baseball (MLB). In 1938, as head coach of the Chicago Black Hawks, he led the team to a championship, becoming the first U.S.-born coach to win the Stanley Cup. He is an inductee of the United States Hockey Hall of Fame. Thomas Francis Hallion is an American umpire in Major League Baseball (MLB) who has worked in the National League (NL) from 1985 to 1999 and throughout both major leagues since 2005. He is a crew chief. Hallion has worn number 20 during his MLB career. He resigned from the NL in 1999 as a failed mass bargaining strategy, but he was rehired by MLB before the 2005 season. Edward Lee Ballanfant was an umpire in Major League Baseball (MLB). He was a player-manager in minor league baseball before his MLB umpiring career. As an umpire, he worked four World Series and four All-Star Games. 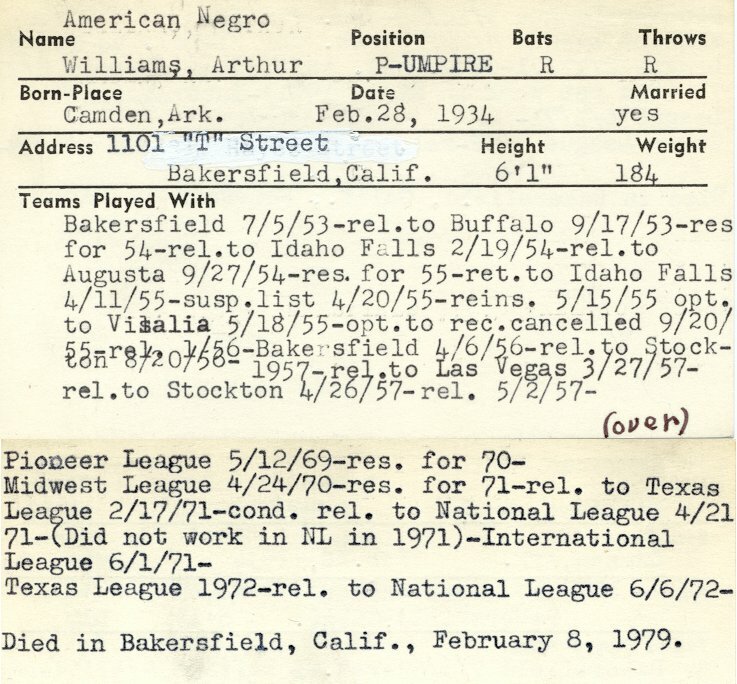 After his umpiring days, Ballanfant spent many years as a major league scout. Robert Jacob Skube is a retired professional baseball player whose career spanned seven seasons, two of which were spent in Major League Baseball (MLB) with the Milwaukee Brewers (1982–83). Skube has also served as a manager and coach in minor league baseball. During his MLB career, he compiled a .250 batting average with seven hits, one double, one triples, and nine runs batted in (RBIs) in 16 games played. Defensively in the majors, Skube played five games in center field, four games in right field, three games as a designated hitter, and one game at first base. Robert Allen Engel was an American professional baseball umpire who worked in the National League from 1965 to 1990. Engel wore uniform number 5 for most of his career. Joshua Isaiah Harrison is an American professional baseball infielder for the Detroit Tigers of Major League Baseball (MLB). He previously played for the Pittsburgh Pirates from 2011–2018 and is a two-time MLB All-Star. Nolan James Arenado is an American professional baseball third baseman for the Colorado Rockies of Major League Baseball (MLB). He made his MLB debut with the Rockies in 2013. Arenado has been considered among the top third basemen in the league both for his contributions as a hitter for power and average, as well as his defensive range and arm strength. He is the only infielder to win the Rawlings Gold Glove Award in each of his first six MLB seasons. Corbin Brian Burnes is an American professional baseball pitcher for the Milwaukee Brewers of Major League Baseball (MLB). ↑ "Williams May Become First Black Umpire in National League". Daytona Beach Morning Journal. March 20, 1971. Retrieved February 10, 2013. ↑ "National League Signs Black Umpire Williams". Baltimore Afro-American. March 27, 1973. Retrieved February 10, 2013. ↑ "Umpire Alleges Racism". The Milwaukee Journal. February 15, 1978. Retrieved February 10, 2013. ↑ "Umpire Ashford Calls 'Em Just as He Sees 'Em". Daily News. May 9, 1978. Retrieved February 10, 2013. 1 2 "Art Williams". Toledo Blade. February 8, 1979. Retrieved February 10, 2013.